While Olive the Sheep made her U.S. debut, I took my daughter to Berlin, Germany to see the house and the city where her grandfather grew up. Maddy never met Richard’s father — Karl Lachmann died in 1968 when Richard was 12 years old — but she heard many stories and wanted to see the place where he was born and lived until 1933, when Hitler came to power. Karl, who was Jewish, could no longer continue his legal studies under Hitler’s regime and thus left, first for France, then the U.K., and finally the U.S., where in 1946 he became part of the prosecuting team for the Nuremberg Trials. 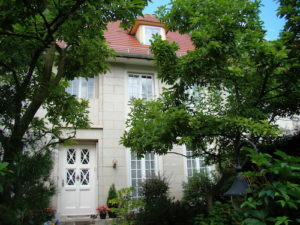 The house in Berlin where Richard’s father grew up, photo from 2008. 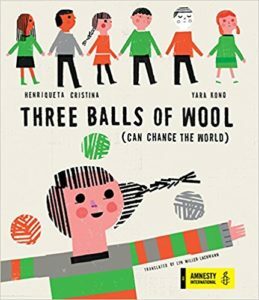 For the rest of the decade [the 1930s], her two children begged her to emigrate. She refused. By the time she agreed to leave, the Second World War had begun, Hitler had sealed the borders, and her travel documents with a visa to Cuba never arrived…. The same house in 2018. Exactly ten years later, I brought Maddy to that house. 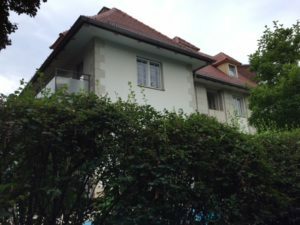 It appears less well kept than in 2008, with overgrown vegetation and rust and water stains on the facade, though the swimming pool that the new owners installed in the front yard is still in good condition. (After the war, the ownership of the house, which fell within the borders of West Berlin, reverted to Karl and his sister, but, with no intention of returning, they sold it.) 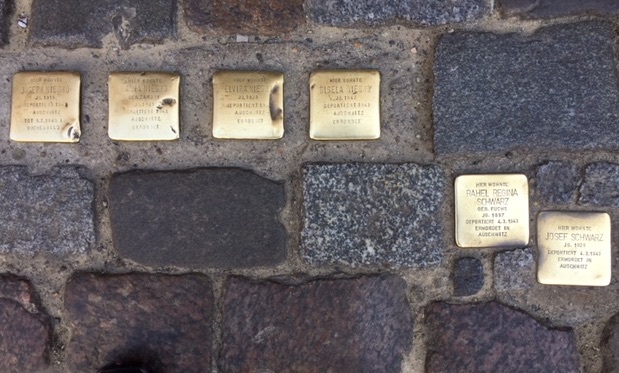 However, on the sidewalk outside the gate are memorial plaques to Margarete Lachmann and Ludwig Goldmann, as this was the last place they resided before their deportation. Many of the memorials to the Berlin Jews are in the Mitte section, where Jewish immigrants from Poland came to live. Maddy standing next to a piece of the Berlin Wall at Potsdamer Platz. These memorials to Jews deported and killed by the Nazis are located all over Berlin, the result of efforts by the city government and local nonprofits to remember the city’s Jewish community, which numbered around 160,000. So far, about a third of the small plaques have been placed — some through the efforts of organizations, others through relatives of the dead. The city’s residents maintain the plaques; it’s common for nearby schools to clean them as part of community service projects. Berlin’s Jewish community is growing again — in large part through immigration from Israel, the United States, and elsewhere in Europe — and Jewish residents clean and repair plaques during the High Holy Days in the fall and on Yom Ha’Shoah (Holocaust Remembrance Day) in the spring. 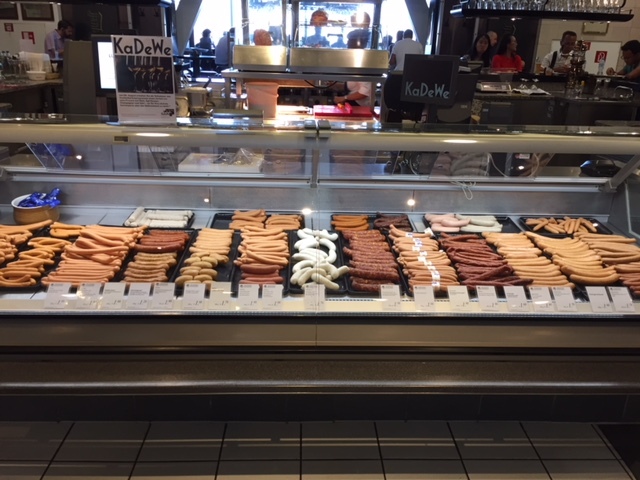 Maddy enjoyed the many varieties of sausages at the food hall in the KaDeWe department store. 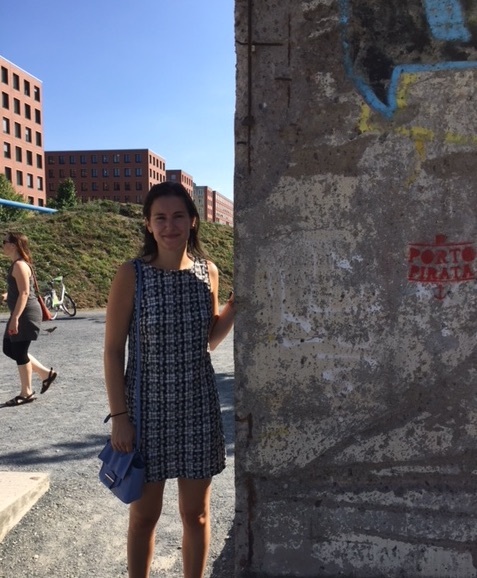 Maddy appreciated this opportunity to learn about her family’s roots, and she fell in love with Berlin. She said that she felt at home in the city despite not knowing a word of German and this being her first visit. She also enjoyed the food, especially the wiener schnitzel, the marzipan, and the currently popular curry wurst. She is already making plans for a return visit to discover more of her heritage and what Berlin has become following years of repression, war, Cold War division, and reunification. .. Arlyn, this is Jerry. Truly a story that must be told, and remembered. Thank you! It’s important to recover those stories and pass them on to the next generation. These markers are so effective. I saw them in Prague when I lived there. How sobering to read your family’s story. It’s also sobering to think that only 1/3 of the markers have been placed. Thank you, Karen! From what I heard, the initial process in Berlin was very organized, but since then there have been huge delays as the demand has outstripped the city’s administrative capacity devoted to this. I do appreciate that schools have taken on the work of maintaining the plaques. What an emotional journey that had to be, Lyn. It was. While I’d seen the house before, the markers weren’t placed until this past May. in Berlin in 2012–and very moving… One whole side of my family emigrated from near Minsk at the turn of the century, undoubtedly during the pogroms then, but thus escaping the later atrocities. I can only imagine how these journeys must feel for you and your family and what it must be like to see the plaque in place. (In another, happier topic, congrats on Olive.). Thank you for this, Lyn. I am glad that you and Maddy were able to make this pilgrimage. The story of Richard’s grandmother is incredibly sad. As you say, we’ll never know why she didn’t want to leave earlier.